The Salesforce Marketing Cloud Content Builder has a selection of empty IU-branded templates you can use to create email. 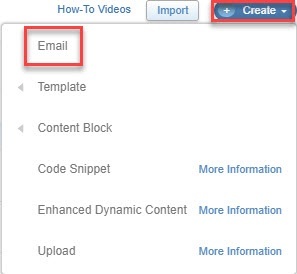 In the content area, click Create and select Email from the drop-down menu. Under "Define Email Properties", from the "Create Email" drop-down menu, select Template. A list of templates will display. Click Folders. Go to Shared Folders > Shared Content > IU Templates > IU Branded Templates. There are eight different branded templates from which to choose. Click a template and then click Select. Under "Define Email Properties", give the email message a descriptive name and select the local folder where you want to save it. Click Next. The template will open to the "Add Content" screen. Enter the subject and click Save. The Indiana University general branding bar is applied by default. For a campus-specific branding bar, see Change the branding bar for IU shared templates in Salesforce Marketing Cloud Content Builder. The template will have several empty layout areas in the right pane. Click one of the layout areas to edit. Drag and drop content blocks from the left pane into the layout areas as desired. Click the content blocks to add content. When you're finished adding content, click Next.